In his first self-published novel, the author crafts a heroic tale about courage, self-sacrifice, and redemption. 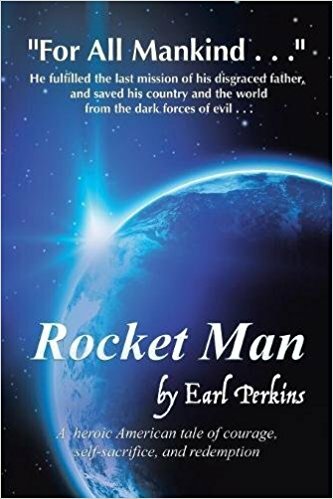 “Rocket Man” is an exciting science fiction novel that also celebrates national pride and patriotism. Earl Perkins proves that with hard work, determination, and perseverance, a person’s dreams can come true. Carrying the dream of becoming a published author, he never gave up. Pushing for his dream to become a reality, he overcomes the challenges of publishing his first novel and today, he’s set to share this one-of-a-kind tale to the masses. Today, “Rocket Man” has proved to be a delight to readers of all ages. The plot revolves around Pete Allen, a Marine pilot who then became an astronaut working for NASA, and his father, a disgraced Marine officer. Rumored that his father’s superiors are working with Russia and its infiltration to America’s high-level intelligence program, the story follows Pete’s mission to save the country from evil. Most of all, he carries on the mission to save and bring back his father’s honor. Hoping to delight more readers with his exciting novel, “Rocket Man” will take part in the upcoming 2018 Frankfurt International Book Fair. The world’s largest trade fair for books is happening on October 10-14, 2018. This great event will showcase thousands of great titles and Perkins’ science fiction novel will definitely be of attendance! Earl Perkins always wanted to be a sports writer, but the allure of writing a novel with a great story to tell has always been a dream for him. With no formal training or education other than graduating from U.S. Grand high school in his native Oklahoma nearly fifty years ago, Perkins is a retired electrician from the University of Oklahoma and shares a country home with his wife of nearly 25 years, Kathy, in Newcastle, Oklahoma. Earl and Kathy have a son, Ryan, and two daughters, Shannon and Amy, and two grandsons, Micah and Seth.